A few weeks ago, I visited the restaurant supply store, Surfas, for the first time and was completely blown away. So much good stuff (almost too much) for my little foodie eyes to look at. We’re talking dozens of European butters to choose from, hundreds of spices from around the world, sprinkles in every shape and color imaginable, and way too many kitchen goods and gadgets to describe. It was totally overwhelming, but I managed to stay focused on a few items that I was determined to walk out with: ungodly amounts of Valrhona Chocolate and cute metal ice cream containers for the freezer. Done and done. Hello kumquats! I love eating these tart little things almost as much as I love saying their name. And they’re only around for a short window of time, so I just had to stock up. The combination of chocolate and orange is a flavor I’ve always loved, mainly because of these chocolate oranges that I would find in my Christmas stocking. 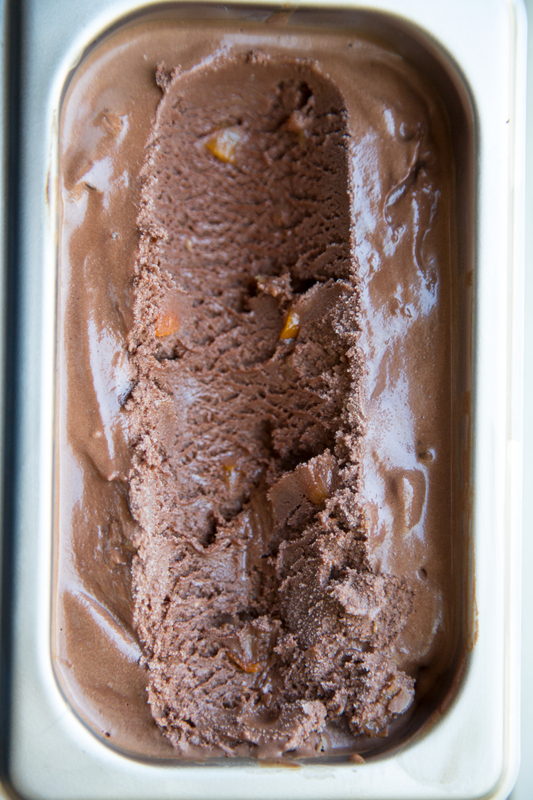 Candied kumquats and dark chocolate ice cream is a very good thing. Enjoy! 1. In a medium pot, bring sugar, water and chopped kumquats to a steady simmer for 15 minutes. Let cool for 5 minutes. Strain syrup and store in an airtight container for later use. * Set candied kumquats aside. 2. Make the ice cream: In a bowl, stir together 1/4 cup milk and the cornstarch; set slurry aside. In a 4-qt. saucepan, whisk together remaining milk and the cream, sugar, syrup, and salt; bring to a boil over medium-high heat. Cook for 4 minutes; stir in slurry. Return to a boil and cook, stirring, until thickened, about 2 minutes. Place cream cheese in a bowl and pour in 1/4 cup hot milk mixture; whisk until smooth. Then whisk in remaining milk mixture. 3. Make the chocolate sauce: Bring cocoa, brewed coffee, and sugar to a boil in a 2-qt. saucepan over high heat; cook for 30 seconds. Remove from heat and stir in chocolate. 4. Stir sauce into ice cream base. Pour mixture into a plastic bag; seal, and submerge in a bowl of ice water until chilled. Alternately, you can chill the mixture in the fridge for about 2 hours. Pour chilled mixture into an ice cream maker; process for about 20 minutes or according to manufacturer’s instructions. Add kumquats and process for another 5 minutes or until they look evenly distributed. Transfer ice cream to a storage container and freeze until set. *Making candied kumquats comes with a bonus: SIMPLE SYRUP!!! Use your kumquat simple syrup for cocktails, over pancakes or whatever you want. That looks simply amazing and stunningly gorgeous!! Love dark chocolate. Thanks Sarah! 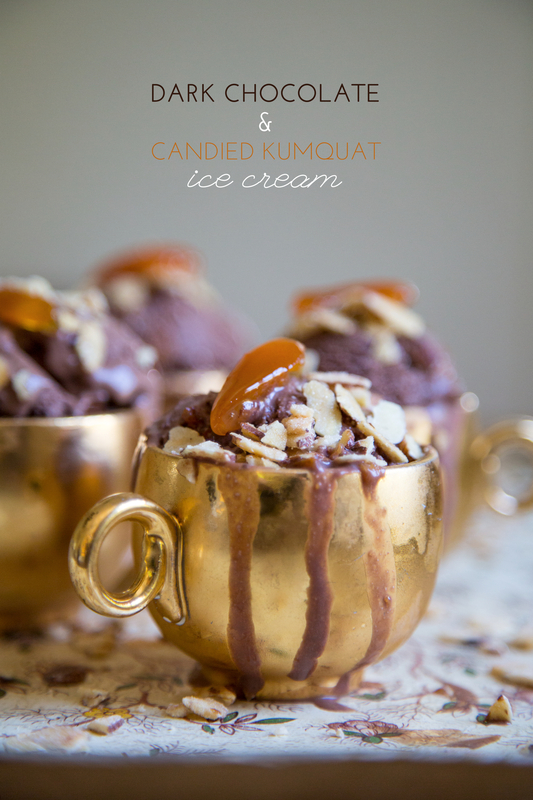 The gold teacups are from Casa de Perrin and the melting ice cream was totally unintentional! But I agree, looks completely decadent. Dazu sag ich jetzt mal gar nix… Sieht nicht nur super aus, sondern ist auch wunderbar in Szene gesetzt! This looks totally heavenly. I have only just come around to the orange and chocolate combo – too many “jaffa” flavoured things (a horrible sweet that may be exclusively Australian). But now I can’t get enough! Would love to try this. Oh, I bet I’d love Jaffa! I hadn’t heard of it, but I Googled :) Sounds right up my alley. I do agree, that too sweet is not awesome, but just the right balance of orange and chocolate and I am in love! Thank you! The cups are from Casa de Perrin. I am in love with them! I just made candied lime slices and my recipe said it would take about an hour for them to dry. It took 2 days plus some low oven time. Did you dry these completely? How long did it take if you did? I didn’t really give my candied kumquats time to dry at all. I just strained and set aside while I prepped the ice cream base, and then added right before the ice cream was set. Does that help? Yum, that ice cream looks so good! I’ve never had candied kumquats before but they look yummy. Love your blog! Thank you Lauren! I actually never had candied kumquats either but I’ve made other candied citrus fruits before. They were yummy, I had to stop myself from eating all of them before going into the ice cream! The bright orange and the deep brown make for such a beautiful desert. Very sophisticated, like what you would serve to a fancy executive to melt their heart. I want some. Your dark chocolate ice cream looks delicious! I’ve always wanted to try making an ice cream with a cooked base. I might have to give this a try this weekend!